I’ve been wanting to draw this for a while now. I think it came out pretty well. And don’t worry, a wallpaper will be coming shortly. Haha, Godzilla is trying to use his atomic breath on Sonic, but he’s too fast. 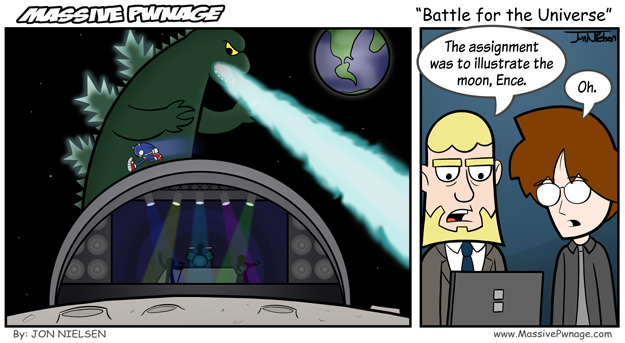 This entry was posted on Monday, July 14th, 2008 at 12:00 am and is filed under Comics. You can follow any responses to this entry through the RSS 2.0 feed. Both comments and pings are currently closed. You never drew this for class,you just recycled it from that job application!